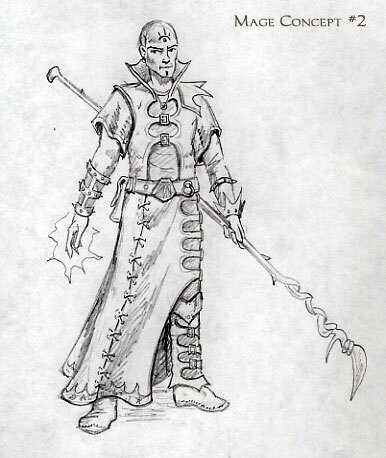 Here are three different concepts for the mages in the game. The first is a fairly traditional, wealthy look. I've also included two, more 'punked up' concepts that might be better for a gritty setting. Let me know what you like and don't like, or if you'd prefer a different direction--I did illustrations for Ars Magica for so long I can do wizards in my sleep. I like all three. The last two are a bit too 'high fantasy' perhaps, but I like the pagan style animal skin clothes of the second. The first one is very traditional, but maybe slightly dull because of that. The first staff is the best. Anyway, I wouldn't complain if any of them were chosen. Edited by Macsen, 06 May 2005 - 05:23 PM. I alos like all three of them. We could make them different alignments or factions inside the mage faction. An idee! Since these guys are going to be transforming into beasts in the final level, if we had ones that wore fur and clothes made of skin they could turn 'inside out' on transformation. Suic-Plop! 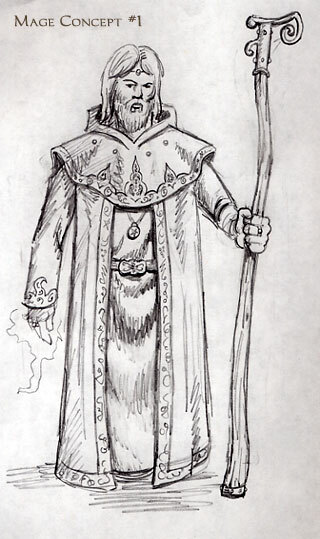 How about one mage model that has an animal skin on his shoulders, with the animals head resting upon his noggin? That's pretty close to what I had in mind for the pagan shaman. I wanted to steer clear of anything that looked too nature-loving for the mages. I'm quite fond on the first one Spring. Looks cool. I personally don't like things that are obviously drawn with "cool" clothes just because they can be. Not that I don't like the last two entirely, just dont' want to head too far in that direction. I like to look at something and think "yeah, that could exist. I'm taking part in an alternate universe here." A bad example is the newer Spiderman cartoon, where all the villans (as with a lot of kids cartoons) have outrageously designed and coloured clothing, impractical in every way and probably not even likely given the setting. So I guess I'd lean towards the first one. I just don't want our characters to look like a character from every other fantasy game out there. I agree with the Sparkhawk, they are all good, and I will do all three for variety. Mages wouldn't be the type to wear the same uniform anyway. I see them as arrogant, vain and flamboyant. We already have thier opposites in the Mechanite faction, who are seedy like eccentirc weirdos working in dirty labs and factories. Since you say you're an expert in doing mages, maybe you can do more detailed work on these guys, with colours, so I'll make them closer to what you wanted. Sure thing. It'll take a little longer for the colour as I can't easily do that at work. But I'll get on it. I think oDDity was replying to Napalm in an uncouth manner. Hmm, 20 days later? Maybe. Well, I'll do some anyway. 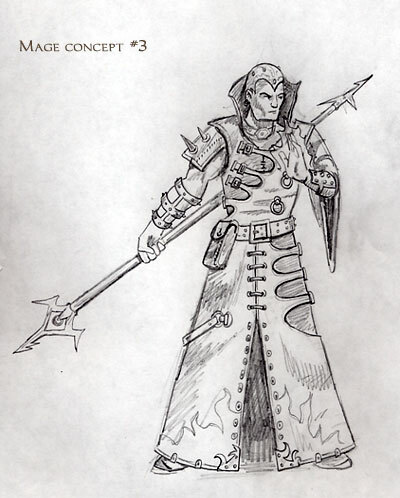 Is anyone working on mage2 concept? Not that I know of. But again, the last thing we need is another partially finished AI model. ok, any ideas of what i can do before my vacation's over?